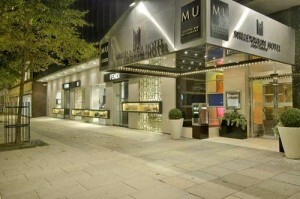 Situated in Central London, Millennium Hotel London Knightsbridge is a few steps from One Hyde Park. It is ideally located within walking distance of Hyde Park Corner Tube Station. Guests of the hotel have access to its wide variety of facilities, including meeting rooms, 24-hour room service and an executive floor. An internet connection is available for those wishing to stay online while travelling. Additionally, the multilingual staff will be on hand to offer local knowledge, ensuring an enjoyable stay in London. Every relaxed room at Millennium Hotel London Knightsbridge includes cable / satellite channels and a mini bar, and the bathrooms feature bathrobes and showers. All have complimentary toiletries, wireless internet access and in-room movies. During their stay at the hotel, travellers can enjoy a meal at Le Chinois, which offers Chinese cuisine. A daily breakfast is available upon request. London’s attractions, such as Hyde Park Corner, Sloane Square and Harrods, are within a 10-minute walk of Millennium Hotel London Knightsbridge. It is also within a 20-minute walk of Hyde Park and the Victoria and Albert Museum.